Alan grew up in the wine industry and took the responsibility seriously from the start. I grew up in the wine industry and helped my mother, Delia Viader, with our first harvest in 1989 when I was 9 years old. I grabbed a shovel and jumped into a fermentation tank to dig out the grape skins. I would always help out during weekends and summer vacations. I took the responsibility seriously, helping in the cellar and vineyards with pruning, suckering, clearing rocks and using jackhammers to plant vines. I’ve worked closely with many great winemakers over the years, and one that I respect and value highly is Genevieve Janssens from Robert Mondavi. She challenged and helped train my palate, and more importantly she pushed me in ways that helped build my confidence very early on in my winemaking career. Creating something that other people enjoy is highly rewarding. It’s touching that they value my wines enough to make them a part of their celebrations. I’m essentially a farmer, so like any farmer the climate is my greatest challenge. I’m constantly reacting and adjusting my vineyard practices depending on the weather forecast. 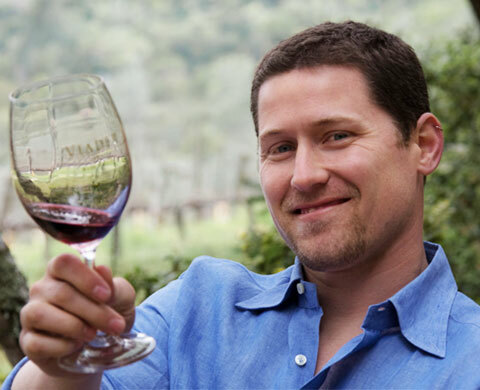 If you weren’t a Napa Valley vintner, what would you be doing? Maybe wrenching on super cars? I’m kind of a “gearhead” at heart. I’m always modifying or fabricating something on my own vehicles or the vineyard vehicles. I would have loved to share one of my recent wines with my grandfather, Walter Viader. It was always his dream to have me work for the family business. He knew that I was working in the vineyards and that I started helping in the cellar, but I was never able to share a bottle of finished wine with him that I had personally made. He passed away in 2006. Robert Mondavi was a close family friend. He came to my wedding in 2006, where I shared with him some of our wines which I played a part in creating. I’d love to share with him some of the current releases now with a few more years of experience under my belt as a winemaker. I never had the pleasure of meeting Andre Tchelistcheff, so I missed the opportunity to sit down and enjoy a glass of wine with him. I love backcountry camping and exploring. I’m an avid adventure seeker. I love to go off-roading in my Jeep or on motorcycles when I can sneak away from work. I’m a brown belt in traditional Japanese Karate and also a purple belt in Kenpo martial arts. Creating something that other people enjoy is highly rewarding.